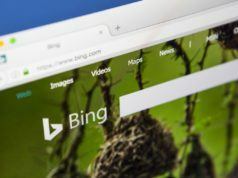 Even though Google dominates the search engine market worldwide, Bing has created a niche for itself where millions of users prefer it over Google. 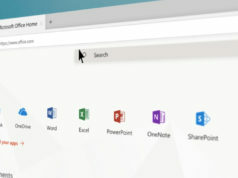 While there are many Google search tricks, Bing also has search engine shortcuts and several advanced features that can be used to get better and accurate search results. 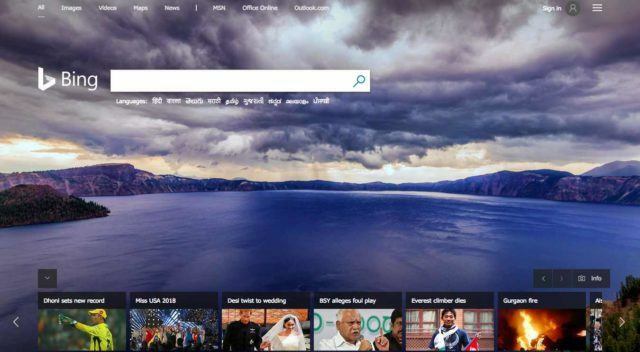 These Bing search tips and tricks will help you narrow down search results to find exactly what you are looking for. 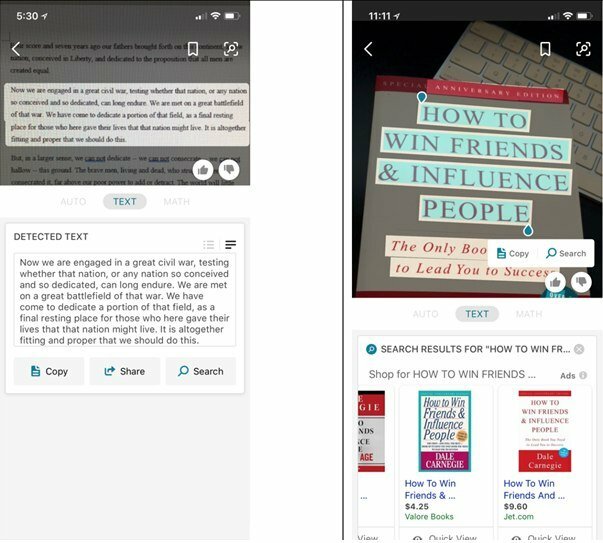 Before diving in, do take a look at our other tips and tricks articles to get the best out of the apps and software you use. Those who hate maths are going to love the next Bing search trick. Microsoft recently introduced the Math Solver feature in its search engine. It can solve mathematical equations for you. 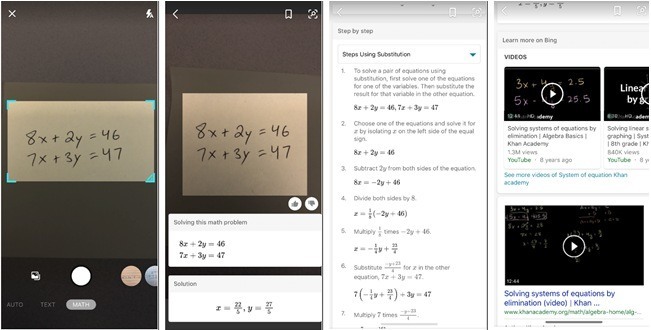 Just take a picture of the equations and tap on the “Math” button placed at the bottom menu between “Auto” and “Barcode.” You will immediately get the answer along with step by step explanation for it. This is the latest addition to Bing Visual Search. With Text Transcription, you can identify objects and find similar ones on the web. Just point the camera on a text to copy and search the text written on it. You can also use it to take a picture of a phone number to call directly from your phone. Clicking a picture of an email ID will add it directly to an existing contact, and you can even visit a website through the URL in an image. This Bing Visual Search tip will let you do a quick image search by dragging and dropping an image, from Bing or desktop, directly to the advanced image search box. Alternatively, you can also paste an image or URL directly to the search box to conduct an advanced image search on Bing. If you hover the mouse over the thumbnail images that appear in Bing Video Search section, a short preview of the video is played automatically with audio. It helps you figure out whether the clip is relevant without visiting the website where that video is hosted. Bing search engine can answer your programming query right away. Just type your programming query, and the search engine’s advanced algorithm will extract the code snippet (if it is available) from any indexed article, online documentation or forum discussion. The answer or code snippets will be displayed in the search result itself with a link to the source article. The best part isn’t over yet — you can also use the Bing Search as a code compiler. Let’s say you want to learn about arrays in C++ language. Just type C++ array in the search box, and you will see a code compiler right in the search results with a code for arrays in C++ language. You can modify the code, change values and compile it right there on the search page! Up next is an extremely useful Bing feature especially for those with hearing inability. 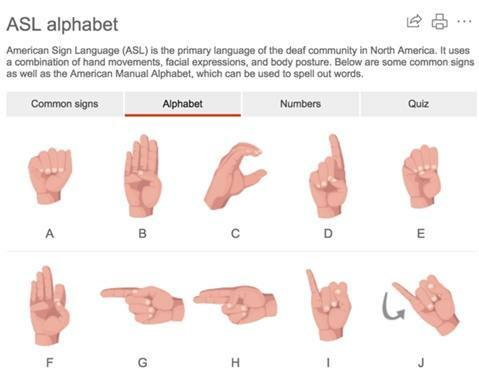 Type “Sign Language” to view 159 videos of words and 13 phrases in American Sign Language that can be used by students seeking to learn sign language in schools. 8. 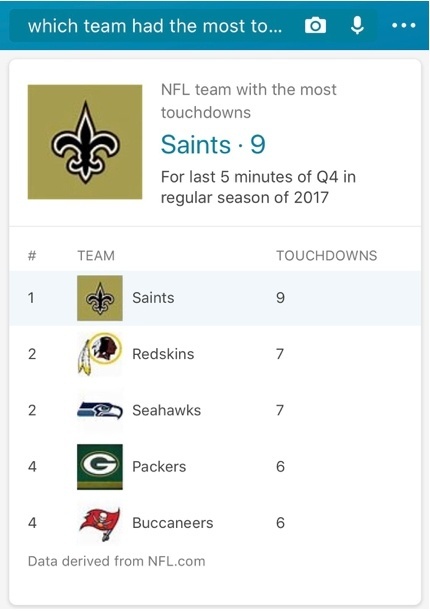 Get NFL stats right away! For all NFL lovers out there, Bing search provides them in-depth and context-specific information on every NFL game played from the year 2000 to date. Using + between two words make sure they appear together. E.g., let’s say you want to search articles related to VPN apps on Fossbytes. Just type VPN apps+Fossbytes, and you will see all the articles related to it on our website. Using – minus does exactly the opposite of the symbol mentioned above. It ensures that a specific keyword is not included in the search results. For example, Jaguar -car will show you results for only the animal Jaguar instead of Jaguar car. Use quotes over a specific string of words or sentences to find web pages. It is useful when you are trying to find the exact source of certain paragraphs. It finds web pages that contain either one of the terms. Make sure you write OR in capitals. Example: Mercedes OR Audi. 13. Find document, PDF, PPT, MP3, videos, ZIPs, etc. The command filetype: lets you search files that you specify with the operator. For eg., if you want .ppt files on computer networking, just typed filetype:ppt computer networking. This Bing search operator will display URLs that contain a ppt file related to the subject. You can do the same for other file types as well. Near the URL, you will also find a “Web View” option on the results page. Clicking on it will directly open PPT, PDF, or doc files on the browser. You can use inurl: to search for web pages that contain a specific keyword in the URL. Both of these Bing search operators are handy especially if you own a website or blog and need to filter out specific pages from the directory pages. Similarly, inanchor: or inbody: looks for keywords in anchor or body of the web page. meta: lets you filter content based on special tags in HTML. This will show all pages that include windows 10 in the meta tag. The next Bing search trick is extremely useful while searching for the perfect images. imagesize: constrains the size of returned images and is valid for Bing image search only. Small – Both width and height are less than 200 pixels. loc: or location: will return search results related to a specific country or region only. You can specify the country or region code directly like this — loc: India. 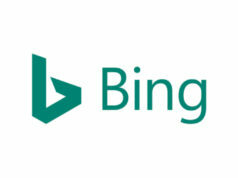 prefer: will emphasize a search term or another operator to help the Bing search engine focus on it. For example, football prefer:history — this will bring more articles related to football history. feed: can finds RSS feeds for you to make news reading easier. For example, if you love reading technology news, you can find a list of RSS feeds in Bing search results by typing feed:technology. You can do the same for sports, politics, or any other topics you can think of. hasfeed: is another advanced Bing search operator for the searching RSS feeds. It specifically finds those web pages that contain an RSS or Atom feed on their website. site/domain: can limit your search to a particular root domain like .edu, .gov, .org. So these were some advanced Bing search tips and tricks I know of. Let us know which Bing tricks you found most helpful. In case you know of some other good tips and tricks to search efficiently on the Bing search engine, do share it with us in the comment box below!